Since it began in 1976, the Windows Project has run workshops aimed at promoting writing for all ages and abilities within the community. The Project makes particular efforts to provide for children, since they will be the writers of the future, and for those with disabilities, whose abilities are often inadequately supported. 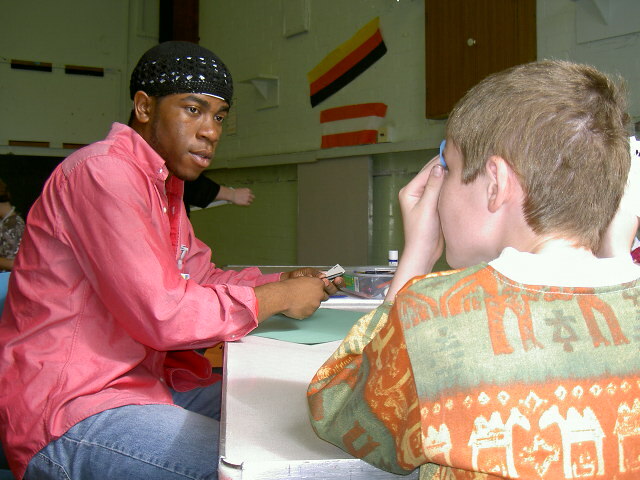 The Project runs workshops each year for specific user groups, including youth clubs, day care centres, writers groups and those in care or custody, but its general strategy has been to create, where possible, long-term regular "residencies", where a writer - preferably based as locally as possible - visits a group on a more or less weekly basis. This enables the development of greater trust and awareness within the group than could be fostered by occasional sessions by visiting tutors. The nature and length of these workshops is arranged initially with the centre concerned but usually then develops by discussion with the actual users. They can range from the simple promotion of writing, through game-based approaches to poetry, script and story-writing or autobiography to criticism and advice for more experienced writers. These workshops, variously funded by local authorities, Windows' own fundraising and the centres themselves, demonstrate the current range of the Project's work, encompassing playwriting and storytelling with under-10s; Saturday clubs in libraries; an alternative to snooker for teenagers in youth clubs; specialist advice sessions for the public and writers' groups, and year-round opportunities for both young and adult writers with disabilities or learning difficulties to develop their potential.